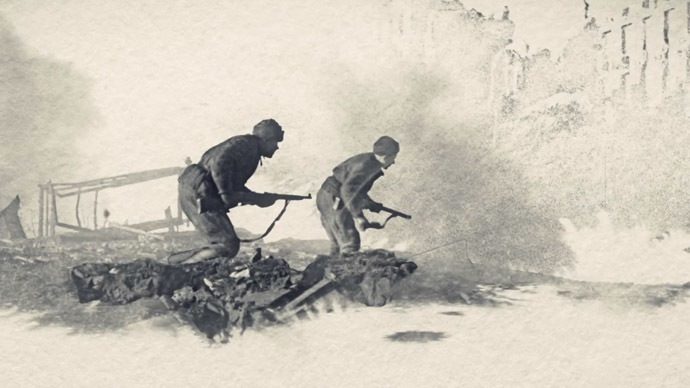 A battle that lasted over six months and claimed over 2 million lives, the fighting for Stalingrad became the bloodiest confrontation of World War II. Stalingrad (now named Volgograd) was home to over 500,000 people. In July 1942, it became clear that the Nazis had made it their next major target. The Soviet forces had to create a defensive frontline quickly, sending inexperienced troops to the area without proper preparation. By September, the Nazis forced the Red Army to retreat into the city of Stalingrad itself, where every street and every building would become a bloody battleground. The fighting was so fierce that the average life expectancy of a soldier was only 24 hours. Despite mounting casualties, neither side was willing to back down, with both Hitler and Stalin sending more reinforcements to the frontline. By mid-November, the Germans had taken most of the city, but left their flanks exposed. The Red Army seized the opportunity to start a counter-offensive, which, in the end, allowed it to surround the Nazis and cut off their supply routes. This was the end of Hitler's 6th Army, and his offensive on the Eastern front. The six months of fierce fighting left at least 2 million people killed, and the whole city of Stalingrad reduced to rubble. Decades later, the remains of fallen soldiers were still being found during construction work in the rebuilt city. Battle of Stalingrad veteran Aleksey Nevzorov told RT what it was like: "The Germans were pressing on, harder and harder. The earth was shaking, making you want to squeeze yourself into the ground." He says a soldier's life could end at any moment: "We soldiered on, even though at times, to be honest, it was horrible. They could get you with a machine gun, a bomb, a shell, a mine... And the conditions! There was nothing to breathe." And you can read about the Battle of Stalingrad, as well as all the other major confrontations of 1941-45, on our page #victory70.